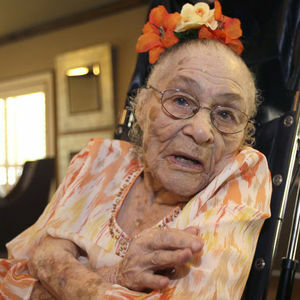 LITTLE ROCK, Arkansas (AP) — Just days after becoming the world's oldest documented person, 116-year-old Gertrude Weaver died Monday in Arkansas. Weaver became the oldest person in the world after the death of a 117-year-old Japanese woman last week, according to records kept by the Los Angeles-based Gerontology Research Group. Weaver was born in 1898. Add your thoughts, prayers or a condolence to Gertrude's guestbook. "I remember the day I met u and I started calling u Grandma u will be miss by me and other had so much wisdom and I will always luv u thank God for putting u in my life." You are a Sweet Lady and it would be an Honor to have known you Rest In. Peace"